A Sad Chapter Ends… or Does It? On Friday, March 11, 2016, Venus Williams made her return to Indian Wells, facing Japan’s Kurumi Mara in a first-round singles match. 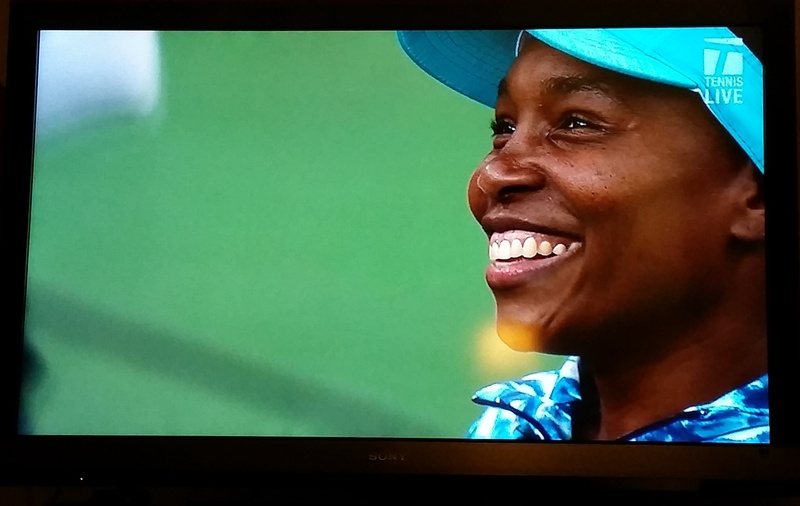 It had been 15 years since Venus last played in the tournament, and she received a warm welcome as reflected by her broad smile in the photo below. In March 2001, when Venus last appeared at Indian Wells, she was scheduled to meet her sister Serena in the semifinals. As it was reported by most media sources, Venus defaulted just moments before she was to have played Serena. Tennis writer Joel Drucker (2009), wrote that “four minutes before her match against Serena, Venus pull(ed) out with tendinitis. Players usually notify officials that they will be unable to compete at least 30 minutes before a match so organizers can make contingency plans” (para. 13). Serena related a different version of this story in her autobiography, where she wrote that during Venus’ quarter-final match against Elena Dementieva, she was dehydrated and started to cramp; she also hurt her knee and questioned whether she would be able to play in the semifinals against Serena (Williams & Paisner, 2009). On the morning of their scheduled semifinal, “Venus checked in with the tour trainer and told him she didn’t think she could play” (Williams & Paisner, 2009, p. 64). According to the rules, the trainer needed to give his approval before Venus could officially withdraw. The trainer was then supposed to consult with the tournament director who would typically schedule another match in its place. [This part is confirmed by Drucker’s statement above]. Checking in with tour officials was an especially important step since Venus and Serena were scheduled to play on live TV (on ESPN) before a crowd that eagerly anticipated the “rare tennis treat” (2001, p. 3C) of seeing the sisters play each other for only the sixth time in their professional careers. There was clearly a lot riding on whether or not Venus and Serena played that match. Yet, according to Serena, the trainer “kept telling Venus to hold off on making any kind of final decision” (Williams & Paisner, 2009, p. 65). Two hours before the match was slated to begin, Venus again told officials that she would not be able to play, but still no announcement was made that she was withdrawing. It was not until five minutes before the match was to start that a tournament official finally “announced to the packed stadium that Venus was withdrawing due to injury” (Williams & Paisner, 2009, p. 67). Needless to say, the timing of the announcement could not have been worse and fans unleashed their anger toward Venus since she was made to appear as the culprit who withdrew at the last minute. Two days after Venus’ default in the semifinals, Serena played in the final against the Belgian Kim Clijsters. When Venus and her father entered the Stadium to watch the final, fans responded by booing vociferously. Richard Williams proclaimed that a dozen fans in the stands used racial slurs and one fan yelled that he would “skin him alive” (Smith, 2001, p. 3C). According to some sources, fans were upset not only because of the late default, but also because they had the impression that Richard, was responsible for orchestrating the outcomes of their matches. Dementieva, whom Venus defeated in the quarterfinals, had even suggested in her press conference that she thought their father Richard would decide who would win their semifinal match (Drucker, 2009). A headline in the National Enquirer also suggested that Richard ordered Serena to lose to Venus in the 2000 Wimbledon semifinals. This further fueled the impression of match-fixing. Aside from such accusations about match-fixing, there has never been any concrete evidence to confirm that this is anything more than speculation. In fact, Bart McGuire who was then CEO of the WTA Tour, issued a statement on March 16, 2001, saying that “The tour is aware of the assertions being circulated regarding Venus and Serena Williams’ head-to-head matches. We have seen no evidence to support those assertions, and both players have denied them” (Drucker, 2009, para. 29). On March 23, 2001, Venus addressed the role of the press in fueling the story about what happened at Indian Wells. When asked about the crowd’s response at Indian Wells, Venus said that she didn’t always understand the press, but she understood that they wanted a big story and they were “interested in selling papers” (Drucker, 2009, para. 49).Indian Wells’ Tournament Director Charlie Pasarell addressed the question posed to Venus about whether it was unfair of the crowd to respond as they did. Pasarell reported that he cringed “when all that stuff was going on,” adding that “it was unfair for the crowd to do that” (Drucker, 2009, para. 51). At the beginning of Drucker’s (2009) article, the editor noted that “the controversy surrounding Venus and Serena Williams’ decision not to play at Indian Wells has been composed of rumors, conjecture and confusing comments about racism and match fixing” (para. 1). While it may be difficult to make sense of all that has been reported and recorded by the press about Indian Wells over the last 15 years, what happened there in 2001 was enough to make the Williams’ sisters decide not to play in the tournament for the past 14-15 years. I vividly remember watching that match and was embarrassed by the vitriol spewed toward Venus, Serena and their father Richard. I have always understood their decision not to play at Indian Wells. While I applaud their willingness to forgive and move on, I question if that chapter is truly over if we have not fully addressed the underlying impulse for the crowd’s (mis)behavior at Indian Wells in 2001. Rare tennis treat: Williams vs. Williams. (2001, March 15). USA Today, p. 1C. Smith, D. (2001, March 26). Williams decries fans as racist. USA Today, p. 3C. Williams, S., & Paisner, D. (2009). On the line. New York, NY: Grand Central Publishing. This entry was posted in Tennis and tagged Indian Wells, venus williams on March 19, 2016 by tennisprof1.